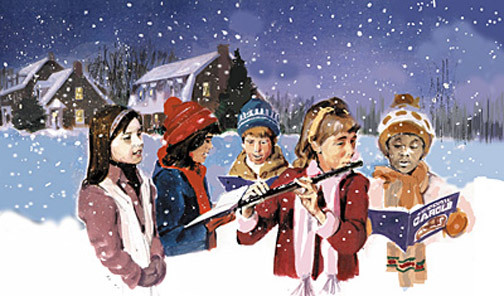 While music still figures importantly in Christmas celebrations in North America, it is increasingly uncommon that entire families should break into song on Christmas Eve, or that carolers should wander the streets spreading good cheer. I think this is partly due to the proliferation of pre-packaged Christmas music, where the Vienna Boy's Choir comes to your living room (or your mp3 player) in high-fidelity, and partly due to the fact that more and more people simply aren't cheerful at Christmas, for a whole range of reasons (stress,commercialism, and SAD figuring prominently among these). So, who feels like singing? Well, let me tell you something about that. A very wise counselor friend once told me, regarding depression, that "sitting around and waiting for a good mood to overtake you" is an exercise almost always destined for failure. You have to "fake it until you make it," she said. Obviously, this is simplistic in regard to biological factors, like SAD, or clinical depression, but otherwise, it's completely true. Being "up" is something you most often have to put conscious effort into. You fake it, until you make it. Which brings us back to the subject of caroling. Raising your voice in song is a very, very old and time-honored way to celebrate life. We don't do it nearly enough anymore; we leave it to the "artists" to do for us. But making homegrown song can be a whole lot of fun, and can generate a whole lot of good cheer - and even moreso if someone in your family plays an instrument and can provide accompaniment. But even if that isn't the case, there are ways to get around it. Karaoke sites on the web, and other sites devoted to Christmas music. Instrumental CDs of Christmas music that you may sing along to, etc. If you're uncomfortable with this, then try singing when you're by yourself. Sing at the top of your lungs. I do, even when I'm not by myself, but most of my immediate family is used to it, and several of them do the same. To help you along with this, I'm establishing a links category comprising nothing but links to Christmas music sites. Another idea: if the old, time-honored Christmas songs have gotten a bit flat, try making up silly lyrics of your own. I realize that from a conventional, religious standpoint, suggesting this may be tantamount to heresy, but you and I know that people want to enjoy themselves during the holiday. So, do what it takes, within reason.